Ads.txt is a Standard by the IAB and stands for "Authorized Digital Sellers". It is a simple text file which contains information about companies that are allowed to sell traffic from the website where the ads.txt is placed on (e.g. www.website.com/ads.txt tells which companies are allowed to sell traffic of www.website.com). With ads.txt a potential buyer can validate if the offered traffic is valid - or with other words: The buyer can verify if the seller is allowed to sell the traffic. How does an ads.txt file look like? If a website works with 3 companies, the file contains 3 (or more) records. If the website works with more companies or has multiple accounts with some companies, the ads.txt file will obviously contain more rows. How does it work with resellers? In this case the website uses two SSP and these are (re-)selling to three exchanges. 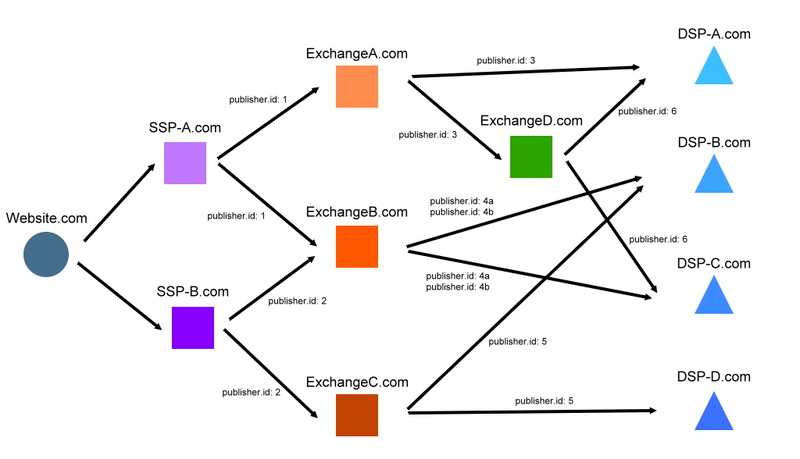 One of the exchanges also (re-)sells the traffic to a fourth exchange. At the end the traffic is offered to several DSP. In short: The website needs to ask both SSP if they are selling the traffic to a reseller. If that is the case, the website needs to add the reseller's info in its ads.txt file (in this case exchanges A, B and C). If one of the resellers sells the traffic to another reseller (exchange A to exchange D), then even this info needs to be included too. At the end the ads.txt file needs to contain each party which is sending the traffic to a next party, so that the next party can verify it. Hint: Use our managed ads.txt service in order to automate changes in your resellers ads.txt files!